Dialogue between Buddhism and Meaning Therapy and the Second Wave of Positive Psychology. 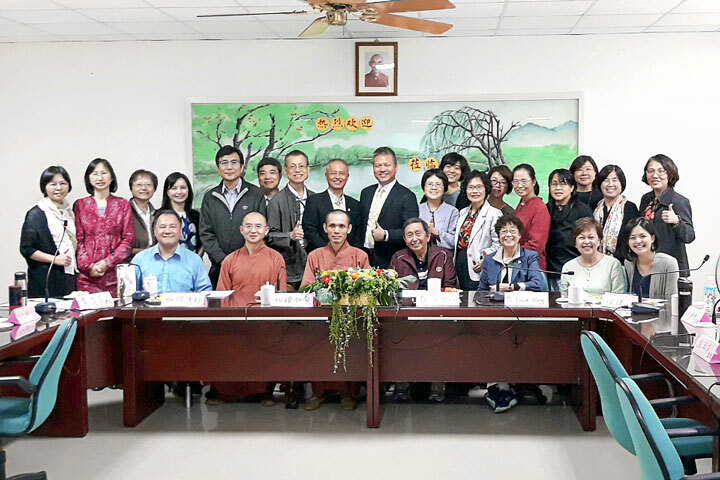 The founder of Meaning-Centered Therapy (MT) and the Second Wave of Positive Psychology (PP2.0), Dr. Paul T. P. Wong, and his wife Dr. Lilian C. J. Wong visited the Bliss and Wisdom Educational Park (BWEP) in Gukeng Township, Yunlin County, Taiwan on 10/23, along with Professor Chi-Yun Lin, Executive Director of the Life Education Center of the Ministry of Education, Professor Sue-May Zhang of the Department of Education of Kaohsiung Normal University and Professor Huei-Min Harriet Wu of the Department of Psychology of Fo Guang University. 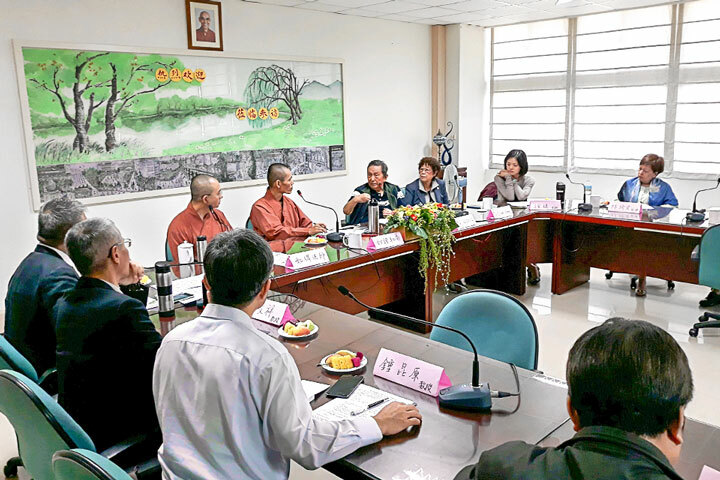 After the discussion between Dr. Wong, Venerable Ru Zheng, and Venerable Ru De, the participants all expressed that the meeting was like experiencing the baptism of a summit meeting between western psychology and the Dharma teaching. Dr. Wong first introduced the Meaning Therapy and the Positive Psychology 2.0 content with the six letters CASMAC (Note 1), and by discussing how he amended the Positive Psychology 1.0, which only saw the happy side. Dr. Wong pointed out that because life is always a mixture of bittersweet experiences, to not look at the painful side is not only a violation of human nature, but also an emotionally impossible paradox. 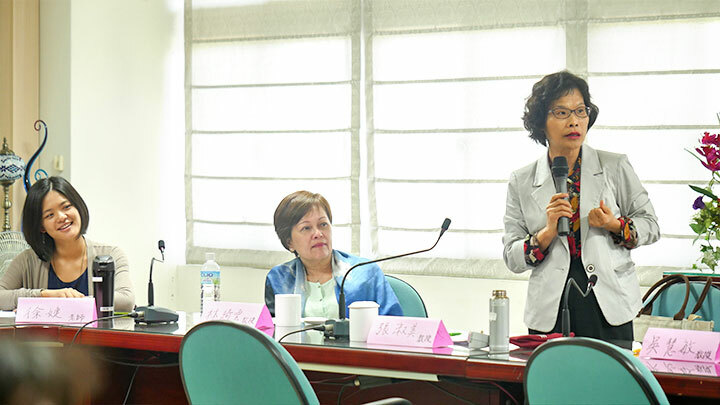 Therefore, Dr. Wong proposed that Positive Psychology 2.0 should be amended to become "a transformation" in the face of adversities, difficulties, and suffering to another mind state. The inner mind should cultivate an attitude of being compassionate, forgiving, appreciative of kindness, and OMAK (Observe Merits and Appreciate Kindness) by treating everyone and every situation with mature happiness, and loving others and yourself at the same time. In this way, the mind will be more meaningful and mindful in various situations. This is what one can accomplish through a change in perspective, because if there is no love between sentient beings, it is like a fish out of water, and one would therefore lose one's sense of belonging. In the face of adversity, seeking positive meaning can transform the painful state of mind to a truly happy "psychological state". Venerable Ru Zheng indicated that Dr. Wong's explanation of CASMAC's theory and process are very complete, and is a real empirical practice. 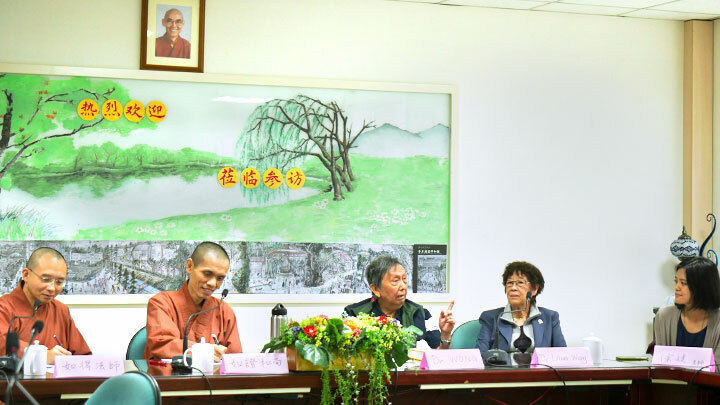 Venerable Ru Zheng praised Dr. Wong as an experienced practitioner, and fully agreed with Dr. Wong's proposition and argument that there is no lack of happiness in suffering. The key point is to find the meaning and to transform the feeling of pain, because if one is inclined to see happiness as the only solution or neglects to find the causes of suffering, it is not possible to find true happiness. The Meaning Therapy and the Positive Psychology 2.0 and the Dharma teaching share a commonality. Because of these approaches, transforming the mind state by facing the pain directly and understanding it, one can accept and find the cause of suffering. When the spiritual mind goes beyond the shackles of pain and proceeds with the correct method of accepting suffering as the process of cessation, it will completely coincide with the content of The Four Noble Truths (namely: suffering, origination, cessation, and path) and the Dharma teaching of “transforming afflictions into practice”, which is the core value of Buddhism. The Venerable also mentioned neuropsychologist Rick Hanson's book, Just One Thing: Developing A Buddha Brain One Simple Practice at a Time, in which he suggested that a seemingly simple matter, if repeatedly done, would not be a simple matter anymore, because this process attempts to transform one's complex and hard-to-control consciousness into a habit of mindfulness. Venerable Ru De quoted from a Mahayana classic, The Seven Cultivation of Hearts, the basic text: “When the mind is filled with sin, the evil turns into an awakened path and will focus on practice. The four practices are methods.” While facing suffering, if we can find the value underneath, then suffering would be meaningful. And the Great Elder Ser-ling-ba, in his “Regulation of Involuntary Resettlement Act” mentioned: “When facing non-virtuous forces, practice virtues; it may be bad causations, but is actually Buddha in disguise. What is minor sickness will eliminate large sins; though it is suffering, it will display Buddha's teaching”. Because the Dharma teachings recognize that suffering comes from “the focus of the self”, and not from external forces, therefore, the remedy is to substitute “the self” for “the others”. In this way, not only can you change and transform suffering, furthermore, you can aspire to withstand even larger sufferings, and even endure the sufferings of all sentient beings. Through this practice, it will enable one's personality to be even more well-rounded. The Dharma teaching goes even further and broader in explaining this point. 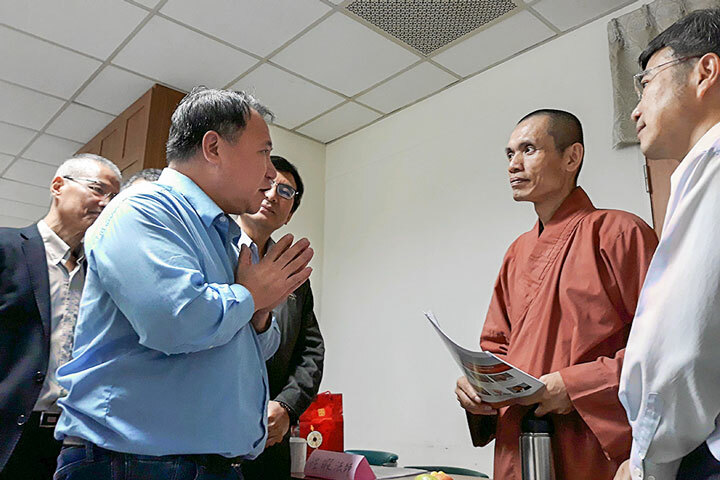 Venerable Ru Zheng concluded that starting the dialogue between Western psychology to include the Dharma teaching is very meaningful, that he hopes to have further exchanges with Dr. Wong between the Dharma teaching and western positive psychology, and that these exchanges can complement each other. If Dr. Wong uses the Dharma teaching perspective to explain positive psychology, the interpretation would be different. Through Dr. Wong's specialty and academic perspective, it would not be considered religious, and therefore, allow the mind to be more objective. In this way, the empirical research of western psychology and the beautiful concept of the Dharma teaching will allow today's generation to accept it as a method to adjust their afflictions; the two can be mutually compatible, and reinforce each other so that they can bring a bright light of hope to those who are in the midst of suffering. Pleased that my PP2.0 presentation was very well received as consistent with Buddhist teaching. (1) Appreciation = Discover the meaning of each moment & observe the merits of each person. (2) It's so unscientific that so many psychologists ignore & suppress findings question that theories. (3) Contributions from Buddhism to psychology: Mindfulness, compassion, acceptance, appreciation, non-self (self-transcendence). (4) Contributions from PP2.0 to Buddhism: Operational definition & measurement, empirical tests of Buddhist concepts & precepts. (5) Contributions from meaning therapy to Buddhist practice: Providing interventions, such as perspective shift, reframing, life review, re-authoring, PURE (Note 2), ABCDE (Acceptance, Belief, Commitment, Discovery and Evaluation / Enjoyment), paradoxical intentions, dereliction, & Socratic questioning. (1) How can we find happiness or wellbeing in a world of suffering? (2) The absence of suffering does not meaning happiness; similarly, the presence of suffering does not meaning unhappiness, In fact, mature happiness depends on both the transformation of suffering and the cultivation of happiness. Thus, PP2.0 introduces a new construct to happiness research. (3) Mature happiness is a mental state of peace and harmony based on spiritual or psychological maturity. (4) Suffering is not something to be deducted from one's overall wellbeing, but a plus factor as mature happiness. The new algebra 4 + (-2) = 6. (5) Thus, fear of death or fear of failure can be transformed through meaning and contribute to one's positive motivation and wellbeing. (7) Intervention = Daily practice of the above principles thru the cultivation of one's spirituality, intellect, compassion and relationships. 2. Dr. Wong has developed the PURE model as a framework for individuals to discover and create meanings for their lives. This is basically a self-regulatory model, which allows trials and errors and constant adjustments to align actions to one's core values and life calling. The “P” stands for purpose and life goals, “U” stands for understanding the demands of each situation and life as a whole, “R” stands for responsible actions and reactions consistent with one's purpose and understanding, and lastly, “E” represents the constant need for evaluation to ensure authenticity and efficacy. The PURE model has been effectively applied to counseling and coaching.